Just my imagination (Running away with me). 2013. 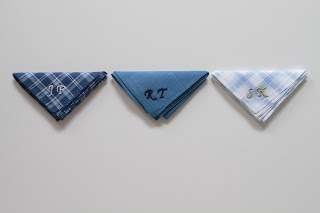 Embroidered Handkerchiefs. I have an exhibition of new works at Stockroom in July, the invitations are fresh off the printers and although it may be unnecessary to do so, I thought I should probably provide a little backstory to the work pictured on the invite. My show, Hard-on for Homewares is about yearning, desire and trying to find a sense of security and belonging. A lot of my work it about this, but this show will focus more on the nesting drive, and more specifically, my nesting drive. This is probably the most personal body of work I've produced to date, and the work pictured on the invitation is more candid that I ever anticipated my work being. The work it titled Just My Imagination (running away with me), it's taken from one of my favourite Temptations songs about how you can be carried away with your daydreams- and those who know me understand the high percentage of time I spend daydreaming, namely the time I've spent daydreaming about my 'imaginary boyfriends': the angle faced man I've pined for since I was seventeen, the curly haired lad who's so handsome and talented it breaks my heart, and the wolf who was so fine in his borrowed wool. This work is like a little ode to them, well, to the image of them that has been with me when I've had no one with me. Really it's a homage to the time that I have poured in to my lovely little daydreams.